Hey TG! I didn't want to bother you with yet another email about my ongoing issues with my Xtra application, (have I mentioned how much I regret not making the drive to TX?) but I did stumble on this thread with a google search and since it's relevant and current, I figured I would just ask here. Is Premium a top coat or a whole other XS-100 like product that itself gets applied in lieu of XS-100? In either case, would it be at all possible to apply it as a Renew process over a botched Xtra application that itself has already been "Renewed"? Not sure what happened with my Xtra applications, but adhesion issues (with XS-100) aside, my entire roof and hood are completely flat black and the topcoat flakes off and sticks to my windshield. The sides are holding up fairly well. I took it in to my GOOD local shop that supposedly "pioneered" the Xtra process, said that they would have to develop a process to treat it with Premium, but this was months and months ago. Thanks again TG...you are an ideal example for all Line-X shops, reps, etc. Bedliner Review Complaints - NOT!! I just got a LineX installed on my truck. Time will tell how good it is.. but it sure looks nice! I have a hard tonneau cover... so I went with the standard black. Line-X is all over this site. It seems almost like they own this place. Make sure to compare and review specifications between Rhino, Line-X, Scorpion and maybe a few DIY lining Spray bedliners. There's a big difference in the materials used for all these applications. I hope you are pleased with LINE-X. If you plan on getting a tonneau cover for the bed, standard black is fine. If you don't plan on getting a cover for the bed, I highly recommend black Premium or Xtra. Standard - Regular strength, will fade over time. Premium - Regular strength, holds its color and gloss. Pro - Extremely strong, will fade over time. Platinum - Extremely strong, holds its color and gloss. Regular strength is fine for most people, but extreme strength is available for those who need it or just want it. You mentioned Rhino Tuff Grip. Tuff Grip (and Hardline) are both weaker (by way of tear and tensile strengths) than standard LINE-X and both will fade over time. That's based on the products' technical data sheets which I have. You can get them also, just call the corporate office. 1. It only has a 3 yr/36K mile warranty. LINE-X has a lifetime warranty. 2. The Ford liner is about half as thick (65 mils) as LINE-X (125 mils) on the floor. 3. If you have a problem, the auto dealership can't fix it, it's going to an aftermarket bedliner store for the fix. 4. If something has to be fixed, the original product is not available. 5. 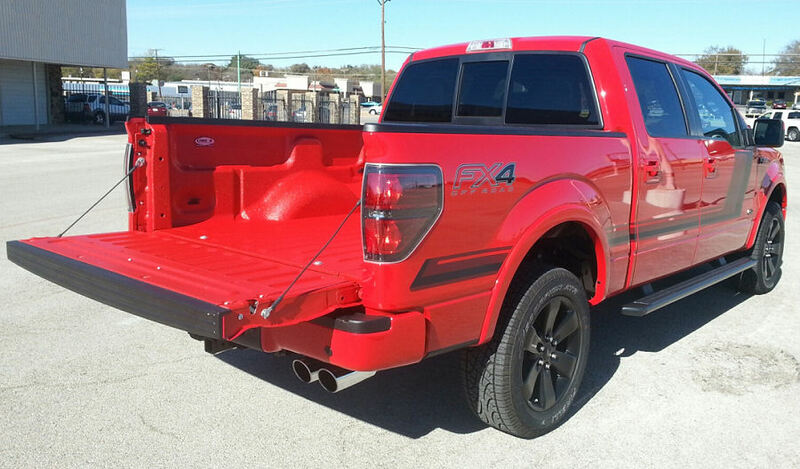 The factory bedliner is aromatic, it will fade due to UV light from the sun unless you are using a tonneau cover. Thank You again to this list for the Line-x recommendation. It's going on 2 years that I had the standard spray in applied. We have a Toneau cover so I chose the standard application. We travel and load everything we own in the bed and to date we have no chips, scratches, or thinning of the bedliner. We use puzzle matts under items that would slide and scratch it up but honestly I doubt if we need that extra protection, it's so tough. I had a Line-X in my 2004 FX4 which held up perfectly over the years I had the truck. During that time I hauled pallets of landscape and cinder blocks, all the materials to gut and renovate my entire house and more. After 9 years it had only one small chip (smaller than a dime) near the tailgate from being hit with a forklift. I was always amazed that a power wash always restored it to a near-new look. Will be getting it in my new truck in June, can't wait! I'll never go with anything else. Spray on bedliner: Quality = the applicator! Not true, they have multiple materials just like line-x, rhino, etc... Look at the comparison of materials that Spray-lining has to line-x and Rhino. I researched this & tried a few in my shop. Line-X has 8 products for truck beds, Rhino has 3, these are various polyureas; all are quality formulas. Scorpion is soft only & Speedliner is only hard. I used Scorpion & Speedliner because the didn't require expensive spray equipment. Spray-Lining makes all or most of these polyureas, called poly hybrid. I tried them to see if their main product called SLPV-100 can cure soft or hard, rough or flat & any color. Yeah, Spray-Lining is controlled by mixing at different ratios & their clear bedliner is tinted with uv auto paint. Sorry for being biased now but I'm a dealer now for Spray-Lining. The body shop next to me used Line-X and had a Graco made EXP-2 sprayer. I did truck beds cheaper & thicker & they sold their dealership (for a loss) but they were & still are professional with me; i.e. friendly. I just bought that equipment from them because SLPV-100 sprays through it + Spray-Lining duplicates Line-X Pacxon I plan to spray also. Overall all these products and manufacturers are good. What many truck owners may not consider is the quality of the applicator. Its like a paint job; the applicator matters more than the paint. You got that right. For some reason my Line-X "Xtra" coating seemed to be ruined by deer blood believe it or not. The entire roof and hood have all but flaked off, and the sides are starting to dull now and will soon start flaking away as well. Between adhesion issues and what seems to be a poor topcoat for longevity, I don't think I'd do the whole truck again. I have a real nice looking Sportster seat pan done in "Premium" that is holding up fine, but it won't ever see as much UV or elements that the truck will, so not a fair comparison. There are TONS of little-bitty companies like Spray-Lining and what's interesting to me is that most of them, including Spray-Lining, try desperately to compare themselves to LINE-X. That's because it's fairly well known in the industry that LINE-X is the best. Regarding the comment that Spray-Lining has a product like Paxcon. Fact is, many companies have a product similar to Paxcon, but, only LINE-X Paxcon was allowed to come anywhere near the Pentagon and nuclear subs. I'm not saying Spray-Lining and the other companies are bad companies or offer bad products. I'm saying that LINE-X still remains the company to beat and the other companies will have a very difficult time doing it. One more thing to mention: Spray-Lining's website has LOTS of incorrect information. Just one example, the website states, "Polyureas require high pressure." No, that's is not true! LINE-X Body Armour. 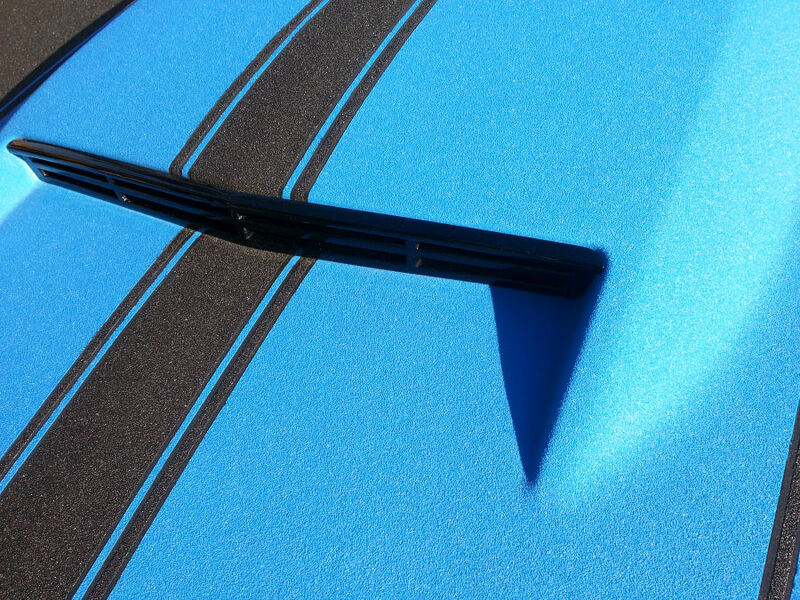 No other bedliner company has a product like it, including Spray-Lining. Sort of unrelated, but MAN this LINE-X in Race Red looks good! Last edited by TruckGasm; 12-11-2014 at 09:20 PM. Nice. Your work TG? Is Body Armour pretty much a "thinner", more lightly applied product? Seems crazy that you can get those pin stripes like that. 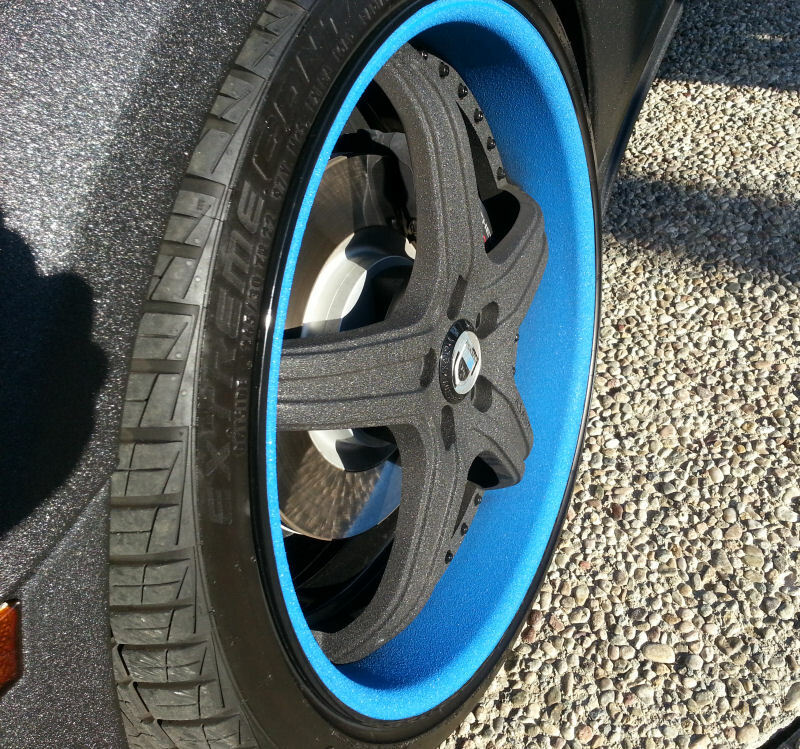 And that center medallion in the wheel. How? I can't even balance my damn wheels and now every time I have a tire re-mounted I have to spend an hour per wheel sneaking RTV behind the first 1" that peeled up. How does the price of a full Body Armour job compare to the bed liner process? Just took our brand new truck for a bedliner and top to our Local LINE X dealer in Williamsport, MD. Had this 2015 for two days and when we picked the truck up from LINE X, brought it home, and discovered a huge dent in the rear wheel fender! When we took it back, the guy said it wasn't there when he worked on it. BUYER BEWARE - THIS LINE X LOCATION is NOT reputable and would not take responsibility for this damage!